Many people have only a vague notion of what climate change is, how it differs from the ozone hole and, frankly, what's so bad about it. For those of you who don't live and breathe this stuff or are curious about the concepts but perhaps don't have a science background, Umbra Fisk, Grist.org research associate, pulled together a good compendium of information links about climate change for the lay reader. GreenGOP commented on one of my posts last week and I'm glad he did. In addition to uncovering Green-thinking (and acting) Republicans and other free-market types, such as New York State Governor George Pataki, Rhode Island Senator Lincoln Chafee, Goldman Chair Hank Paulson, and Venture Capitalist John Doerr, the GreenGOP has some right (as in correct) thinking about alternative energy and global warming, and reminds us that Green is also the color of money. 1. The Climate Crisis is looming. We have enough science to know that there will be changes, whether dramatic or modest, and we must take action now to abate this threat, mitigate its impacts, and invest in alternatives to improve our chances for success. 2. The poor need a hand up not a hand out. Global poverty alleviation is a necessary conservation strategy and the moral imperative of our generation. The poorest of the poor need our help through a social finance system that provides access to global markets, credit and investments to get them on the ladder of economic development, and improved access to education, health care, and clean water, especially for women and children. 3. Biodiversity health is inextricably linked to human health and well-being. Those affected adversely by points 1. and 2. above are also most dependent upon ecosystems and biodiversity. We need to find ways to make those links explicit, create mechanisms for valuing those ecosystems, and ensure the long-term viability of the habitats upon which people depend. 4. Treaties, compacts, and agreements are failing because governments are neglecting to understand the nature of their commitments and the impacts of implementation. (See, for example, the potential failure of most countries to meet the Millennium Development Goals.) We need financial, market, and development incentives to ensure fulfillment of commitments made. We also need to be more realistic about objectives and outcomes, as well as accountability through a global environmental organization (GEO). 5. Globalization is happening, is inevitable, and will make us more interdependent. We should embrace globalization and ensure it is "enlightened" by the environmental, social, and economic triple bottom line. We need to enhance globalization in this regard to realize its potential positive benefits for all people. 6. We need a “Manhattan Project” for alternative energy sources and technologies. We need rapid and large-scale investments to ramp up our ability to bring new or improved alternative energy technologies to market. With oil at $75 a barrel, gas stations running dry across the US, and other countries seizing the day of opportunity, time is of the essence. 7. If you are on our side, we stand together. The conservation and environmental movement is arrogant in its assumption that it can "do it alone" -- every convert, from evangelicals to Lee Scott of Wal-Mart, comes under immediate suspicion and scrutiny. We do not have time and we cannot afford to alienate those whose motives, backgrounds, or livelihoods we neither espouse nor appreciate. We need to be more inclusive if we are to capture the imaginations of people around the world. 9. The environment is losing ground to other, seemingly disconnected issues of the day: poverty, human health, terrorism, etc. These are not separate issues and we cannot view them as such. When the ecological house begins to collapse and more and more people fall prey to poverty and disease, and many more turn to terrorism as a means of accessing what few resources remain, it will be too late to do anything about it. The time to act is now. 10. We need to foster an enduring conservation ethic by telling our stories in as clear and compelling a way as possible. Stories are how we learn culture as humans and, as someone once said, stories can set us free. And maybe, just maybe we can come together to save our world and improve our well-being. Climate Change: Beach Reading - Al Gore's Fallacy of "Crisis"
Vanity Fair's first "Green Issue" is chock-full of celebrities associated -- some only tangentially -- with environmental issues, as well as a good overview of the climate crisis by Mark Hertsgaard. Then there is Al Gore, the current Godfather of the Climate Change movement. In his essay, "The Moment of Truth," the former vice president and champion of climate crisis action makes a common mistake echoed by business consultants, environmentalists, and others when he writes, "The Chinese expression for 'crisis' consists of two characters....The first is a symbol for 'danger'; the second is a symbol for 'opportunity'." I first wrote about this misperception in a posting on this blog back in January: "Crisis or Opportunity, China Looms Large". In that posting, I referred readers to Victor Mair, professor of Chinese literature at the University of Pennsylvania, who debunks this usage on his web site devoted "to the writing Mandarin Chinese in Romanization." Mr Gore does his cause a disservice by repeating what Professor Mair calls a "grossly inaccurate formulation." He should strike this phrase from his otherwise eloquent and hopeful remarks about the climate crisis. 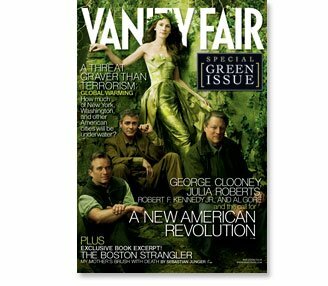 And, okay, I'll confess that although I'm happy Vanity Fair is covering the issue and bringing it to a wider audience, I was a little miffed at not being invited to the party. Next time Graydon, gimme a nod. Climate Change: Achenbach on "Forces of Change"
Is there any controversy about climate change? Not at the Smithsonian! The National Museum of Natural History has found a way to open two new climate change exhibits, starting Friday, without a single smithereen of contentiousness. We get just the facts: Planet's getting warmer, arctic ice is melting, Inuit are out of sorts, Siberia is thawing. The future? "Models predict different outcomes," a sign says. So, I'm on vacation this week, fighting the urge to post, when low and behold Grist, the radical environmental news and commentary magazine publishes an interview with Wal-Mart CEO H. Lee Scott in which he says, "Global warming is real, now, and it must be addressed." Yes, the CEO of Wal-Mart, shoppers; you better believe it. Then today, CNN Money runs a feature from Business 2.0's "Future Boy" about how there may be money to be made with global warming. I just had to share these two stories with my readers. I mean, it really does seem like we're reaching a tipping point. Even here, on sunny Florida's Treasure Coast, when the talk is not centered on the (non-)Sensenbrenner immigration bill, it's all about climate change, the coming hurricane season, and the continuing drought. I'm beginning to think we may be able to muster what it will take to tackle this thing or at least, if it ain't too late, to start taking appropriate action to ameliorate the harshest effects. Climate Change: Kevin Sweeney's "Climate of Hope"
Readers of this blog know that I'm in favor of taking immediate action to address the impacts climate change, regardless of dissenting opinion about the science. We know enough now to suspect the changes will be dramatic, so we should take action to do what we can to prevent the most extreme effects. Moreover, the potential for investments in new technologies associated with alternative energies and climate mitigation could be just the shot in the arm our economy needs. As I've said before, better to take action now than to wait until other countries seize the innovation day. I cannot understand why other free market believers don't espouse this point of view. I suspect it is a combination of being unable to admit they are wrong and not being able to see past the cloud of doom-and-gloom scenarios that keep coming our way. Now for a breath of fresh air: an article in Salon.com this past week by Kevin Sweeney, a visiting prof at U.C. Berkeley’s Haas School of Business, which puts a positive, hopeful spin on the climate change issue. Sweeney, formerly of the Clinton administration and the outdoor clothing company Patagonia, articulates passionately for a national response to the crisis, along the lines of President Kennedy's call to put a man on the moon. In addition, he characterizes the potential clean energy revolution as Silicon Valley 2.0 and the Kyoto Protocol as market research on the climate change issue. I disagree with Sweeney that we should lighten up completely -- the Time Magazine cover story from a few weeks ago warning us the "Be Worried, Be Very Worried" and the Ad Council spots I wrote about last month, are important steps in waking up America. But Sweeney makes a good case for why we should stop whining and look on the bright side of this issue. In a post last summer on this blog, I said that what the green-conservation-environmental movement needed was some rock stars. Forget that William Safire, writing in his "On Language" column in a recent New York Times Magazine, dismissed the term as meaning someone devoid of real talent. Ignore Lou Bedrick's chastising of green-activists' fashion faux pas a year ago in Grist: Greens have now arrived and we are rock stars. Well, at least fashion plates. Social Entrepreneurs: A Fool for Markets - The Future of Conservation? Two articles appearing side by side in the March 25th edition of The Economist contribute to my concerns about the future of conservation tonight. The first is a profile of Vinod Khosla, the Silicon Valley billionaire, and his efforts to move our culture toward clean energy. The second is an expose about the Sumalindo Lestari Jaya timber concession in Indonesia, a country I have been fascinated with for some time. Like many entrepreneurs these days (see my previous post on Iqbal Quadir), Mr. Khosla, the founder of Sun Microsystems and a partner at the venture capital firm of Kleiner Perkins, is turning his attention to improving the world. In California, he is taking on the oil industry by promoting a statewide referendum designed to build investments in clean energy technologies through increased taxes on oil production. His particular interest is in "cellulosic" ethanol, derived from agricultural waste. But his mission is larger than that, according to The Economist, "His plan is to use technology and entrepreneurship to tackle big social and environmental problems." Sounds great to me. As Mr. Khosla told the magazine, "In venture capital, we fail far more often than we succeed...I've decided that I'd better focus on taking on problems that really matter, so that when I win it makes a difference to the world." Mr. Khosla, if you're reading, sign me up. Making a difference in the world, that is why I got involved in the public benefit sector. Yet, in civil society, we are so fearful of failure that we become risk averse at the precipice of innovation. After all, we use "donor dollars" to affect change and, with little financial return for our donor-investors, we may not dream as big as we must to get the job done. We are beholden to those contributions and, if we fail, we risk losing those donors in the future. Perhaps I'm in the wrong sector. But take a look at the timber project on the island of Borneo, the Indonesian half of which is called East Kalimantan. It has more than its share of risk and turns out to be quite exciting. According the UN's Food and Agriculture Organization, as reported in The Economist, "Indonesia is losing almost two million hectares of forest a year -- an area about the size of Wales or Massachusetts. Over the past 15 years, that amounts to one-quarter of its forest cover." Illegal logging and clearing for agriculture -- primarily plantations or ranching, but also small farms and wood for fuel -- are the culprits. The problem is there are both devastating ecological impacts of such clearing and often-adverse impacts on people, whether from flooding, loss of revenue due to accelerated decreases in timber stock, polluted waters, and even the facilitated spread of disease pathogens. The article reports the 2004 findings of the American Forest & Paper Association, an industry group, which concluded "illegal wood depressed world timber prices by between 7% and 16%, depending on the specific product. That competition, it argued, cost American companies alone some $460 million every year." Such cheap wood resulting from illegal logging also "puts pressure on legal operations to cut their costs to compete, generally leading to lower wages and poorer working conditions for their employees." One solution being tested in Indonesia, as well as a few other forest producing countries, is a barcode tracking system. Attached to the timber stock, the barcode can be scanned to reveal the location of the cut, where it is on the globe in real-time, and its ultimate destination. Of course, this creative approach hangs on whether there is a premium market for sustainably harvested timber. However, it may potentially lead to better access to global markets, especially in the US where consumers are beginning to make green-conscious choices. Companies like Sumalindo "believe that there is money to be made by following the law and taking care of the forest in which it operates," says The Economist. Ideas like this intrigue me. They could have a profound and pragmatic impact on how we design conservation in the future. I am both excited and a little apprehensive about this, however, as I begin to wrestle with whether we -- the conservation movement -- have the stomach for such enterprises. The risk is huge and we don't have a high risk-threshold, as I've noted. In conversation with a colleague in Washington the other night, I compared our traditional approaches with that of the emerging microcredit and microenterprise markets used by such entities as Grameen Bank. Might this not provide a third, even potentially better path for conservation? I don't have the answers, but have started to wonder whether following that third path might just save the conservation movement from the slow, methodical and, ultimately, dependent path we're on. I wonder about this because it does not seem, in the face of growing resource and development competition, that slow and steady can win this race.